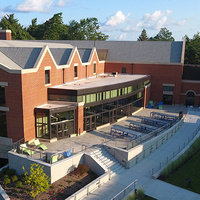 The Jim and Martie Bultman Student Center is located in the central campus, adjacent to Hope’s Pine Grove. The 42,000-square-foot facility, which opened for the start of the 2017-18 school year, is the college’s first dedicated student-center space in more than 35 years. Change Hope: Thank you notes and a treat!